I was going to put Kiara Brook Bethany back in foal to Burmoran Poetry In Motion for a repeat of our filly Timberline Diamond Doll. However have decided not to now so will have none due this year or next year!! I intend to put Prince over a few of my mares and try to get some more pony-type foals to show next year. 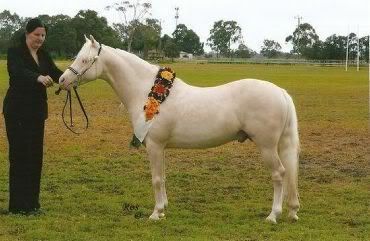 I will probably put him up for sale early 2011 and go shopping for a different type of stallion. Im not sure,I want to breed my filly this year,she is rising 3 to my black buckskin stallion...but then I have a pinto colt comming and I want to breed to him if I think he is mature enough at the time...then at the same time I dont want to breed her cause I dont want any of the 'what if's' to her. I have Fenmarsh Silverena (Silverado Lines) in foal to Glenrowan Master Luck (Marks Lucky Streak Son) So im hoping for some colour. The mare is a silver pinto and the stallion a black overo. 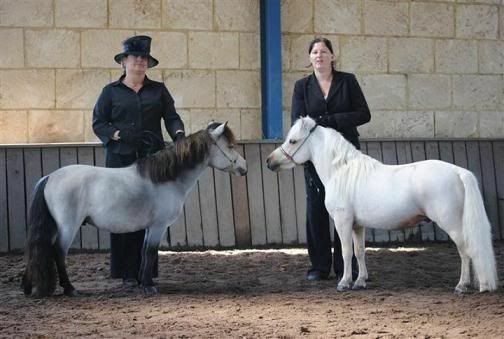 I am then looking at putting her in foal to Heart Acres Commanche Fire dancer (Harrington Park Miniatures). 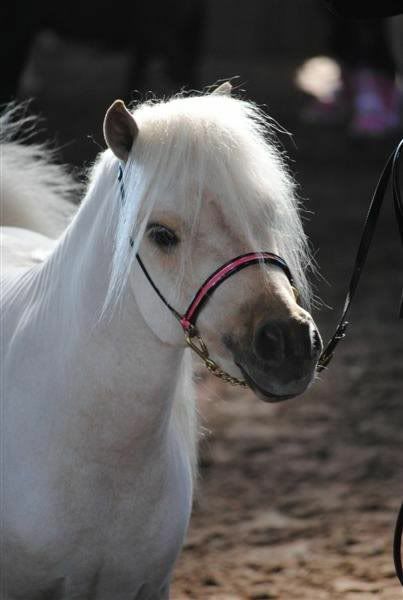 This will be my first mini foal. I have bred Stockhorses for years so im very excited to have a little mini foal on the ground in September. Mini Pony, Palomino 32.5", rising 5yo. 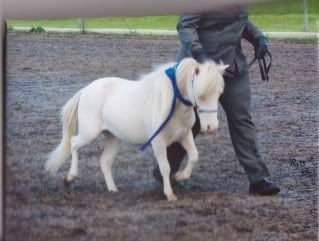 Mini Horse, Silver 33" rising 16yo. Ellenbrook Foxy Lady, Black Tobiano 34" Mini Pony. Remaani Lodge Reckless Angel, Black Tobiano with 2 blue eyes, 35" Small Horse. Petite Pastures Peaches N Cream, Chesnut Tobiano 36" Small Horse. 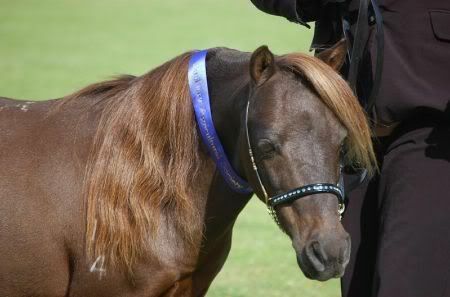 Karajine Mardi Gras, Brown 31" Mini Pony. Not all mare's will be covered i don't think, have not thought much further, just want to get my 2010 foals on the ground first, lol. 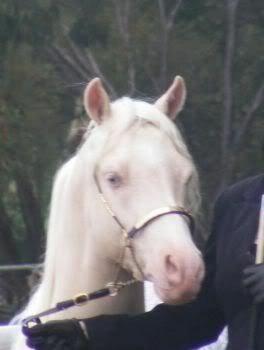 Pt Arab, Cremello 11.3 & 3/4hh, rising 6yo stallion. 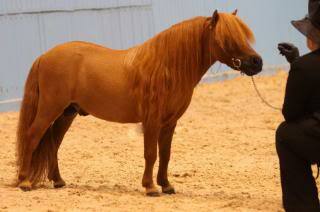 Baraynop Najique Cascade, Chestnut Sabino 14hh Arab Pony/Pt Welsh. 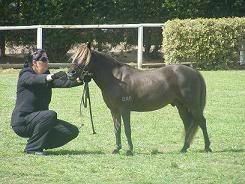 Simosar Antares, Grey Tabino 13.2hh Arab Pony/Pt Welsh. The above stallion won't cover both (at this stage) as i would like to use an outside Welsh A stallion. Sharleen, you cant go wrong with Heart Acres Commanches Fire Dancer. I bought one of his Daughters a few years ago. She's STUNNING. She's joining the big girls this year & going to Mini World Olympic Blue (Ollie). Human preg tests do not work as they test for different hormones. How long were your test kits unrefrigerated? They should be OK if it wasnt more than a couple of days and it was only at room temperature or below, I was told this by the actual NZ scientist who invented the things when I accidentally left mine sitting in my car overnight once. The kits have to be room temp before using them anyway. Just an update to my previous post regarding who I intend to breed this year, I have been fortunate enough to purchase the stunning and successful little AMPS stallion Croydon Park Cherokee from Hope Park Stud and he will be bred to at least 4 of my mares this coming season. I specifically bought him as I wanted a true pony type stallion to put over my ponyish mares. Human preg test kits test for hCG (human chorionic gonadotropin) which is not found in mares. Mares need to be tested for eCG (the equine varient of this pregnancy hormone). When I was at uni studying equine reproduction, we ran a test on confirmed (ultrasounded) pregnant mares at different stages of gestation using weefoal test kits and human ones, to test accuracy. The human ones never worked and the weefoal ones worked between the days they were meant to 120-300, but was most accurate from day 150-270. On some mares they also got positive results after day 300, in one case even up to a week before foaling. Love your red! Is he AMPS?